As has been the case every year since its launch in 2006 in Deauville, NORMANDY SAILING WEEK has racked up an ever increasing number of competitors, despite a busy sports schedule and several other important events in close proximity. 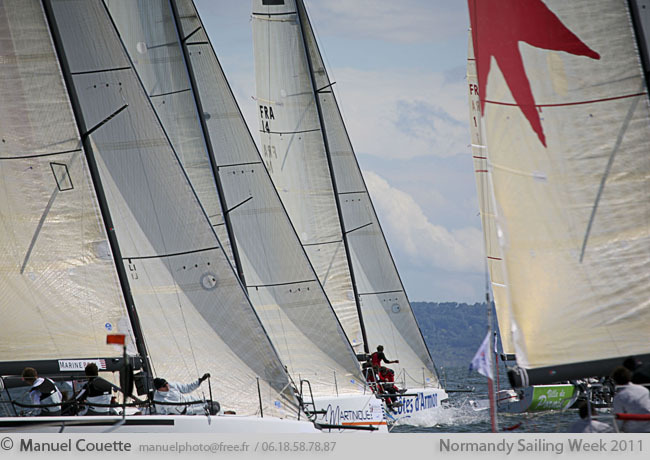 In this way, nearly 110 crews have registered to date for NORMANDY SAILING WEEK 2011, with some still yet to sign up before the start of the event this Friday 10 June in Le Havre, where the M34 series from the Tour de France à la Voile will open proceedings. Such developments on a sporting level reinforce the concept of this major race gathering on the French side of the English Channel, as well as the maritime dynamics of the Town of Le Havre, the Baie de Seine and Normandy in general. The 110 crews are split fairly evenly between 3 fleets (one-designs – sportsboats – IRC racer cruisers), which will sail on 3 separate race zones in the harbour of Le Havre and the Baie de Seine. Meantime the 13 M34s will enjoy a special programme including a 100 mile race on Sunday 12 June to Cotentin and back. This great programme has been made possible by the work carried out jointly by Sirius Evénements, creator of the event, and the Town of Le Havre, a major partner which has played a key role in the event for several years, with the support and commitment of all its local nautical protagonists. The teams from Sirius Evènements, the Upper Normandy Sailing League, the 3 major clubs in Le Havre (Centre Nautique Paul Vatine (Watersports Centre) – Société des Régates du Havre (Le Havre Racing Society) – Sport Nautique et Plaisance du Havre (Le Havre Watersports and Yachting), as well as the Marina, have been united in their efforts to offer competitors an ambitious event which corresponds with their aspirations both on and off the water. With the support of the French Sailing Federation (1st stage of the French Crewed Offshore Racing Championship) and the UNCL, everyone believes wholeheartedly in the event’s potential. However, such a development wouldn’t have been possible without the support of all the leading media of the region (Groupe Presse Normande (Normandy Press Group) – France Bleu Basse-Normandie – France 3 Normandie), Voiles et Voiliers magazine and Sport +, which will once again produce a 26‘ emission broadcast on its network. The economic fabric of Le Havre and Normandy is also providing essential assistance, in particular through the support of two Official event partners, the Caisse d’Epargne Normandie (Normandy Savings Bank) and the AUDI Auto Concept dealer. This will be further boosted by the input of numerous official suppliers, including the region’s top marine businesses ( All Mer, All Purpose, Karver). YOU CAN ALSO JOIN THE NORMANDY SAILING WEEK ON FACEBOOK ! Previous Article Normandy Channel Race : Victory for Initiatives Saveurs! Next Article Normandy Sailing Race : CHEERS!